It’s been a week full of nostalgic moments in the Footy Boots office. On Tuesday, Omar Saleem tip-toed down memory lane as he recalled his top 5 football boot moments of all time, a choice that included Alan Ball’s white boots and Stan Bowles wearing different boots in one game to please two sponsors. Then on Wednesday, the boss got his wallet out – a true moment of nostalgia for all of us as we hadn’t seen him do anything similar since 1987. 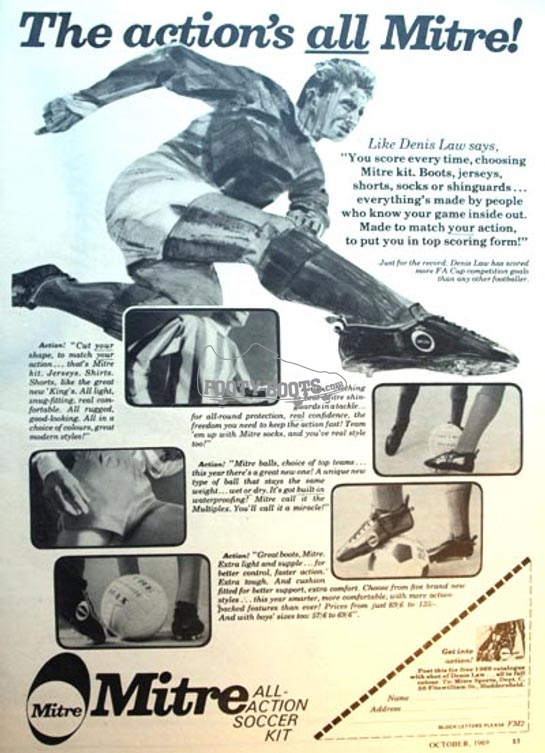 In keeping with the feeling of yesteryear, Footy Boots came across some brilliant vintage football boot ad’s which prove that the boot industry was thriving, just as it is today, over 40 years ago. Our earliest ad is this example from 1957 parading the virtues of the Manfield-Hotspur Continental. 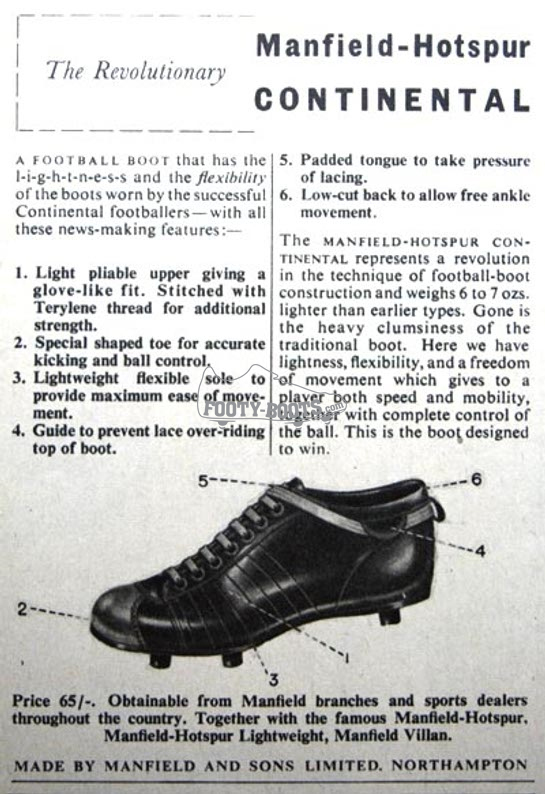 Designed to replace the ‘traditional’ football boot of the time, the MH Continental was light (or certainly lighter than many of it’s competitors) and was said to improve freedom of movement and flexibility. This one hails from 1964, two boots endorsed by Bobby Charlton who was to have such an impact on the nation’s consciousness two years later. 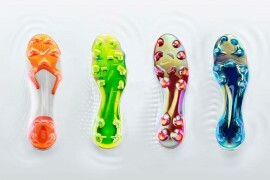 Of particular interest is the Brazilia football boot which boasts an ‘eye catching red moulded multi stud sole’. Even 45 years ago, colour was seen as being important, even if the main part of the boot remained steadfastly black and white. Here’s one from 1968 which could be a forerunner to the Superfly. 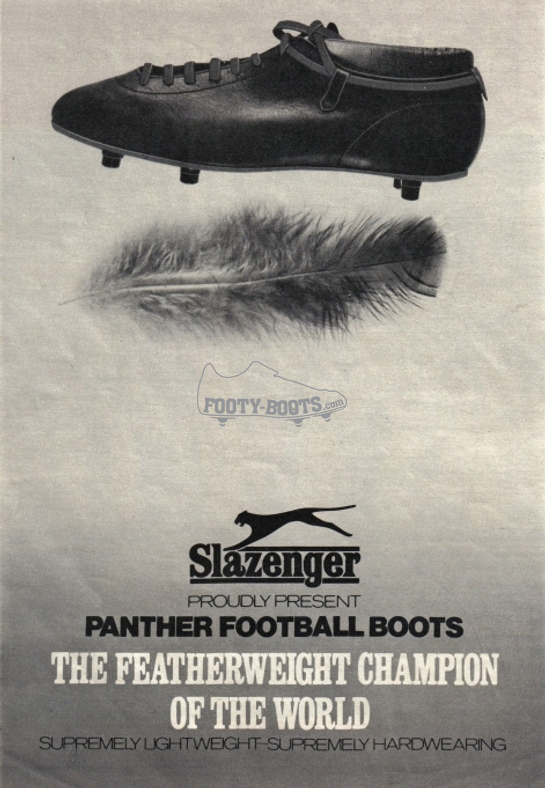 The Panther, designed by Slazenger, was trumpeted as being the lightest football boot around as well as being robust and hardwearing. 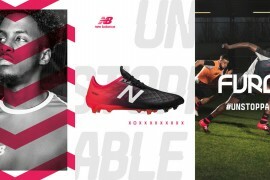 Slazenger, of course, no longer feature in the football boot market although the ‘Panther’ name can still be found on Slazenger cricket bats, hockey sticks and other sports equipment and apparel. 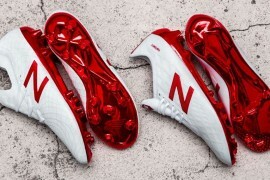 Unlike Slazenger, Mitre football boots are still in production, although up against the big and medium sized brands, they don’t currently make much of an impression. 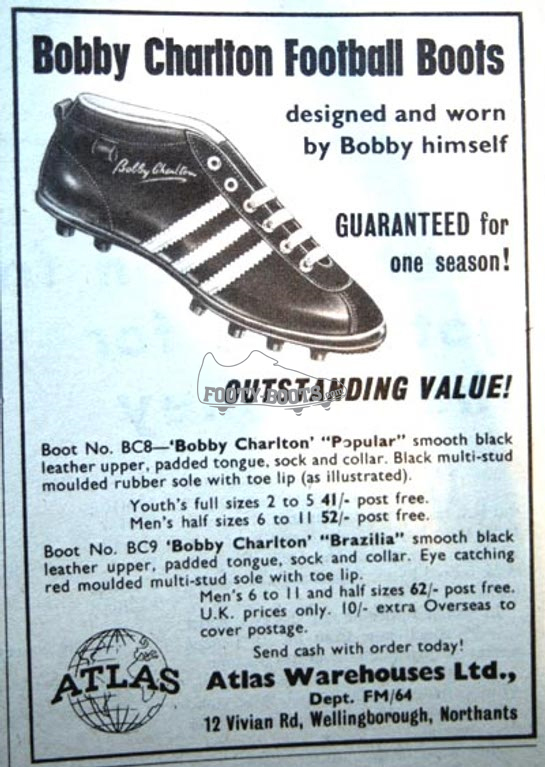 It was certainly different back in 1970 when they had one of the biggest stars of the game endorsing their new boots. Denis Law was first used by Mitre in 1964 however, it was reported at the time that Law wasn’t a great fan of the Mitre product and negotiated a deal whereby he’d promote the product but wear Adidas football boots so long as no-one twigged. Moving in to the colour era, our final advertisement comes from 1974 as the late, great George Best gives his backing to the Stylo Matchmaker. Made from luxurious ‘softie’ leather' it was said that Best was actively involved in the design of the boot which was big on lightness, flexibility and comfort. On the black and white model, the sole plate was translucent polyurethane which allowed interchangeable studs. 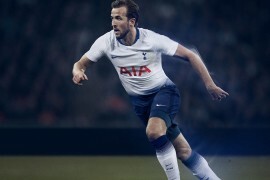 Best also wore Puma football boots during his career and recently a signed pair of his vintage football boots were sold for £1500 at auction. If you have any memories of past football boot adverts, endorsements, or have your own pair of vintage football boots, use the comments section below to let us know about them. Some fantastic stuff here. Just love the Slazenger Panther. Was a Gola man myself…used to like the material on the training shoe toe caps. Its great to see some of those old adverts! 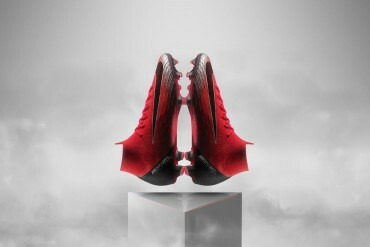 Personally I think the George Best Stylo boots look class! i agree matt, those stylo boots are very nice…they should do reissue “retro” boots nowadays! i mean, they still make copas, and havnt those stayed the exact same since the 70s? 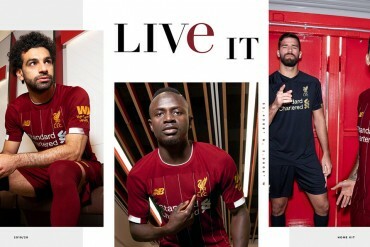 Absolutely brilliant publication guys, love it! i agree with matt, i like the stylo boots, very nice and modern with that white stripe. Any idea how heavy the “featherweight” slazenger boots actually were? Sad to see all these retro boot brands gone nowadays, i’d loved to try them on. 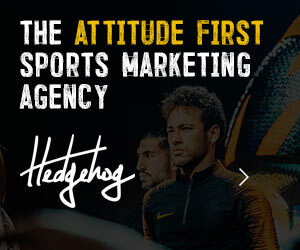 Hi – I just came across this site. I actually own original pairs of most the the boots featured in those ads – and many more vintage pairs from the early 1900s to the mid-1970s. I recently displayed some of them in the TfL “Art on the Underground” exhibition. Anyway, now that I’ve found this place, maybe I’ll post some photos of boots and explain the history behind them. I’m sure people would be interested in stories like how the old boots were “broken in” or Stanley Matthews relationship with the CWS etc. i’ve got a pair of the george best black stlyo boots moulded, been trying to find out what they are worth, in average condition, can anyone help ?? I have a pair of Nat Lofthouse continental football boots with moulded bottom. Brand new, need cleaning. Also, Simlan all leather boots, brand new with original laces and knock-in studs. Anyone any ideas how much they are worth? 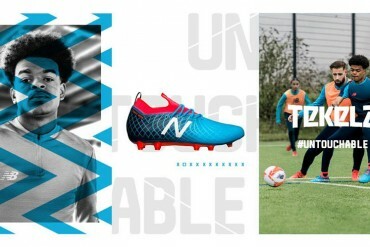 Next Wednesday the 24th Denis Law will be 70 years old,to celebrate this special period in his life why not bring out a replica 60’s MITRE football boot in his honour.PUMA (Pele)and ADIDAS (World Cup ’66) have limited edition boots,SO COME ON MITRE show your appreciation and honour the greatest football ever. 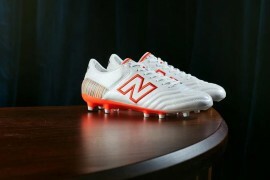 Crazy about English football players, esp about their boots. Still remember Charlie George with his white boots ( Hummel? ), Jon Sammels with his Simlam, Martin Chivers’s PUMA.. players wearing Gola, Stylo, Durs, Winit, etc with padded tongues…designs were just superb. BTW I got original catalogues of Gola, Simlam and PUMA boots of the 70’s. Hi, I wore a Terry Venables pair – magic. Does anyone remember the mad boots with the rotating ring of studs nder the ball of the foot. My son says I’m lying and they never existed. What were they called? I used to have a pair of Terry Venables boots too ! They were great. Mine had blue soles and I think 13 (?) moulded studs. Funny that Arwyn Roberts mentioned an Anniversary shoe from Mitre. 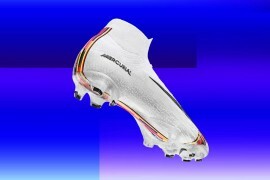 I am one of the boot designers for Mitre International and we are currently working on the anniversary Mitre Campeon boot! 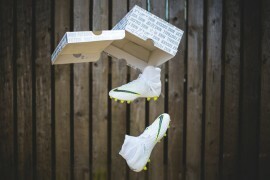 Maybe we’ll have to send footy boots a sample to do a review on when it’s finished? in reply to steven mcc post I had a pair of those crazy boots with the rotating plate under the ball of the foot .They were simlam centre circle boots.They caused more twisted ankles than they were worth ,we must have been mad in those days. 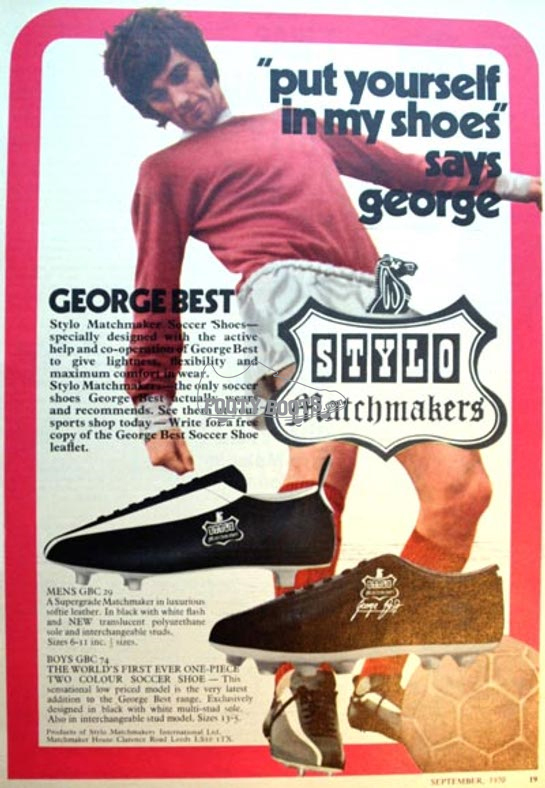 I wore a pair of George Best Stylo Matchmakers in about 1970. Remember they cost ÂŁ5 from Kays which was a fortune in those days. They had a black top which covered the laces. The sides were burgundy. The sole was rubber with 13 studs. The claim was you could bend a ball in any direction which was correct but unfortuently it was near impossible to kick it straight except you side footed it. 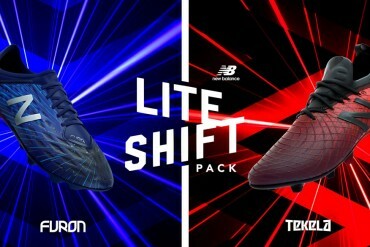 would like to know what kind of brand used to wear zibi boniek since i could not remember!!! any idea please? As a youngster in the 70’s, with the help of my parents, I bought a pair of Steve Heighway boots. They were crimson with a molded sole and Steve’s signature in Gold printed along the side. I think that I bought them through Shoot Magazine. Within three weeks they split along the side and were unwearable. Nevermind. i was the envy of my team mates at the time. Did anybody else have a pair? Best. 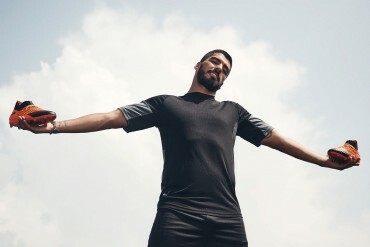 Kevin. I had a pair of Steve Bloomer Super Continental back in 1961. Bought from the Co-op. White soles with silver signature.